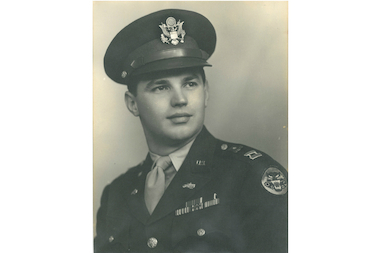 Richard L. Duchossois, chairman of the Duchossois Group and owner of Arlington International Racecouse, served in World War II as a second lieutenant, then captain and eventually a major. While he was not part of the D-Day invasion in Normandy, he later saw combat there, manning a tank. Duchossois, now 92 years old, is returning to France to attend an event honoring the 70th anniversary of D-Day, which took place June 6, 1944. CHICAGO — One of Morgan Park Academy's most famous graduates, Richard L. Duchossois, routinely attends his alma mater's upper school commencement ceremony. The 92-year-old chairman of the Duchossois Group and owner of the Arlington International Racecourse will be missing the June 6 graduation for a special reason this year: to attend a 70th anniversary ceremony in France for the Allied Forces' D-Day invasion of Normandy on June 6, 1944. "I am very humbled and honored to be a part of this event," Duchossois, a Beverly native, told DNAinfo Chicago in an email interview. While Duchossois was not part of the actual D-Day invasion in Normandy, he later saw combat there, driving tank destroyers. In his time as a soldier in Europe, Duchossois was a 2nd lieutenant before being promoted to a captain and then a major. He earned a Purple Heart and a pair of Bronze Stars after being shot in the side, which for a time paralyzed him from the neck down. Duchossois, who leaves Wednesday for France, said his experiences on the warfront and leading men into battle shaped the rest of his life. DNAinfo Chicago: How many D-Day remembrance ceremonies have you attended? Why was it so important for you to attend this year's event in France? Richard L. Duchossois: I have been back to Normandy one time but never for any ceremonies like the one this year to commemorate the 70th anniversary of D-Day. I understand it will be a pretty big affair with some of the events spreading throughout the summer. I have been looking forward to this trip and the chance to go back for quite some time. DNAinfo Chicago: Did your service in World War II leave a lasting impact on your life, especially in terms of leadership? RD: The war broke out in early December and in February I was called to service as a 2nd lieutenant. I hadn’t turned 21 when I became a captain, and at 23 I became a major. When you have leadership responsibilities you don’t have time to think of yourself. It is all about being responsible for those in combat with you and reaching your objectives. DNAinfo Chicago: You usually attend Morgan Park Academy's graduation ceremony every year but won't be able to because of this year's D-Day event. Why is attending MPA's graduation so important to you on a yearly basis? RD: Morgan Park Academy is where my entire philosophy and my approach to life was shaped. It was there, and then in the service that I learned a sense of teamwork and discipline. Then in the service I learned that when you make a commitment you fulfill it. You don’t win anything if you come in second. Either you win or you lose. In the service you live in a culture of trust and friendship, and the only way you can succeed in your mission is to work as a team and a unit. DNAinfo Chicago: For what did you earn your Purple Heart and two Bronze Stars? RD: I was shot in the side. The injury shocked the nerves and I was paralyzed from the neck down for a time. It was a long recovery, but I wanted to get back to the men I had helped train. Would you want to leave your family out there? Those were my people. DNAinfo Chicago: Describe what being in a war is like for someone who has never experienced it. RD: War is a terrible thing to be a part of. You do it, you do your job and then you really don’t want to think about it again. I hadn’t really spoken about it at all until a few years ago when my family started asking me a few questions. DNAinfo Chicago: How fortunate/honored do you feel to be attending this year's D-Day event? RD: I understand the Queen of England is attending and there will be guests and dignitaries from all over the world. It is a truly special honor to be able to attend the event.